Second in a series about opinions held by the “swing voters” of bicycling. To people who ride bikes in many U.S. cities, Portland and San Francisco might feel like heaven. But for the thousands of people in those cities who own bikes but don’t ride frequently, that’s far from the case. The survey, taken in September and October 2013, followed a string of fatal collisions in San Francisco. Not surprisingly, concern was higher there: fully 80 percent of respondents answered “very” or “extremely.” But even in Portland, which hadn’t seen a single bike fatality in more than a year, 69 percent of respondents did so. High though that number is — a 2011 poll of San Francisco voters in general found that 51 percent called biking in the city “unsafe” — it’s not a huge surprise. People who study biking in cities have argued for years that people who don’t frequently get around on bikes are disproportionately deterred by the notion that biking is unsafe. Leslie Carlson, a Portland communications consultant who often deals with bike-related messages, noted that these findings don’t show that biking in Portland and San Francisco is actually dangerous, but only that people think it is. Tomorrow’s post will have new insights on this question. Stay tuned. If you’d like, you can download the raw results of the survey and a full PDF report of our findings. 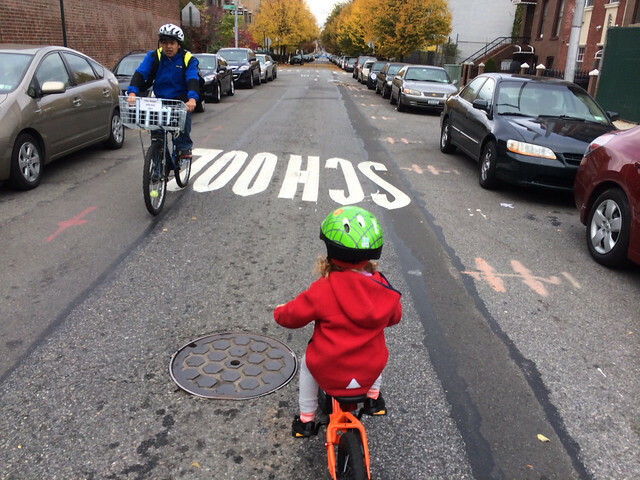 The Green Lane Project writes about the ways cities are building better bike lanes. You can follow us on Twitter or Facebook, or sign up for weekly emails of our latest news here. Photo by Doug Gordon.